Hello everyone! 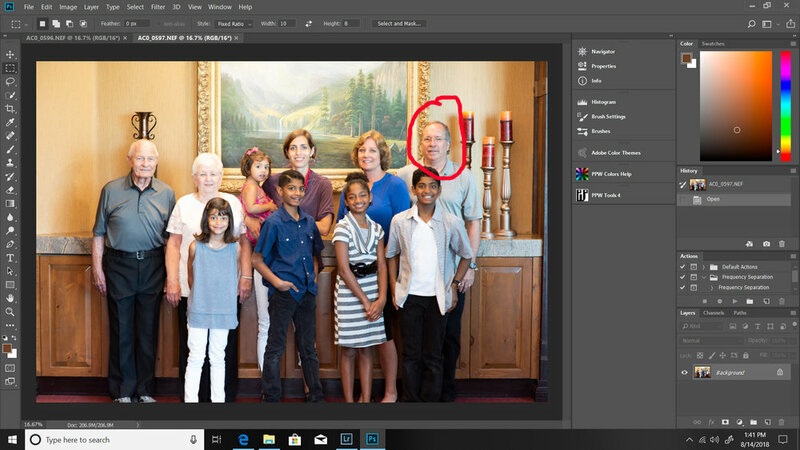 So of you may have seen a video on my Facebook page at www.facebook.com/awdcphotos about me editing a family portrait, and "magically" making someone's head who wasn't looking at the camera turn into that same person apparently looking straight at the camera in the photograph. Well, you're in luck! I will be posting here a walk-through of how I did that. First off, let's see the picture! Hey! Looking pretty good! Except...Dangit! He's not looking at the camera. Whatever shall we do? We are going to make a composite image, of two separate images. Now it's important to note that, this is USUALLY done when shooting a static (not-moving) background area, with a tripod. In this case, I was NOT using a tripod. Time to test how steady of a shooter you REALLY are! Luckily I had another image that was VERY similar, where this same gentleman was actually looking at the camera, which can bee seen below. Ah, that's much better! Now, this image may look ok to many of you and you may ask, "Why not just use this one?" Well, the rest of the family's faces are actually a bit blurry in this image, and sharper in the first one. So we are going to combine the crisp, sharp family faces from the first image, with the gentleman's face from the second image. So, while in the photoshop work area we will press CTRL or CMMD + A to select the whole second image, and then CTRL or CMMD + C to copy it. Then you will go back to the first image where he is NOT looking at the camera, and press CTRL or CMMD + V to paste it over the first image, making a new layer. Ok! Now you should notice the circled area in the screenshot above, the two layers that now exist, and the top layer has the "looking forward" face. The background will be the original image with the "not looking forward" face. Alright! So far so good. Now we will select to lasso tool from the left tool pane and select a general area around the portion of the image that we want to KEEP. In this case, that is his face. In the screenshot above, the "marching ants" will show the selected area. Ok, now you will press CTRL or CMMD + SHIFT + I to "Invert" the selected area. This will automatically invert the selection, so that we can select the "waste" of this layer (the blurry family faces and background), while keeping the good portion of the "looking forward" gentleman. Now the marching ants should be going around the whole frame of the image, AND his face. Just remember, his face is NOT selected at this point and would be "negative space" of the selection. Now we are going to press SHIFT + F6 which will bring up the "feathering" box. It will ask how much feathering, or "radius", you desire. In this case I chose 15 pixels. That means that we will soften the edges of our selected area by a width of 15 pixels, so that our selection won't be a hard line. A "fade" towards the edges. This will help the "looking forward" face blend in with the original image background, when we get rid of the currently selected background of the second image. Set to your desired feathering radius, and press ok.
Ok, the next step is simple! Press the "del" key. The marching ants will remain, but you know you deleted the selected area by looking at the lower right hand portion of photoshop. The circled areas in the screenshot above will show the marching ant selection, but ALSO in the lower right hand corner the top layer is now mostly blank! Except for the gentleman's now "looking forward" head! That means now the family and the background that is still visible, is from the first layer. Getting there! Not done yet though. Alright, now let's clear the selected area by pressing CTRL or CMMD + D, or by single-clicking anywhere on the picture with a selection tool. We will then press CTRL or CMMD + T for "Transform". If you'll notice, the two pictures did not line up quite perfectly. But that's ok. There will be a square box that will show up around the area of the top layer that is still "populated with pixels", meaning anywhere that still has a portion of picture still in it. In this case, that is just the gentleman's head because we just deleted the rest. When transform is selected, you mav click and drag, rotate, or "transform" the selected area. So we will play around with this gentleman's head, until it lines up very well with his neck and torso. Once we are happy with how it looks (the more NATURAL the better) we will press ENTER. This will set our changes, and get rid of the transform box. Now for a few final adjustments! If you zoom in you'll probably see that what you're working on isn't quite just perfect. in this case the picture frame is kind of blurry. So we will select the "Eraser" tool from the left hand side tool palette. Adjust the size to your liking using the slider at the top of photoshop, or by pressing the "[" or "]" keys to size the eraser tool down or up, respectively. Erase what you want to expose the bottom layer or original image. Also, and this is silly, his Adam's apple is still from the first image where he was looking down instead of the camera! Not to worry, you may select either the "Healing Brush" tool or the "Clone tool" and experiment around with those until you get the look you want. You may size either of those tools in the same way we sized the Eraser tool before. With the Healing Brush, you only need to paint over the area you wish to blend into it's surroundings. Make sure you have selected "Content-Aware" first, in the upper area on photoshop when using the healing brush in this way. 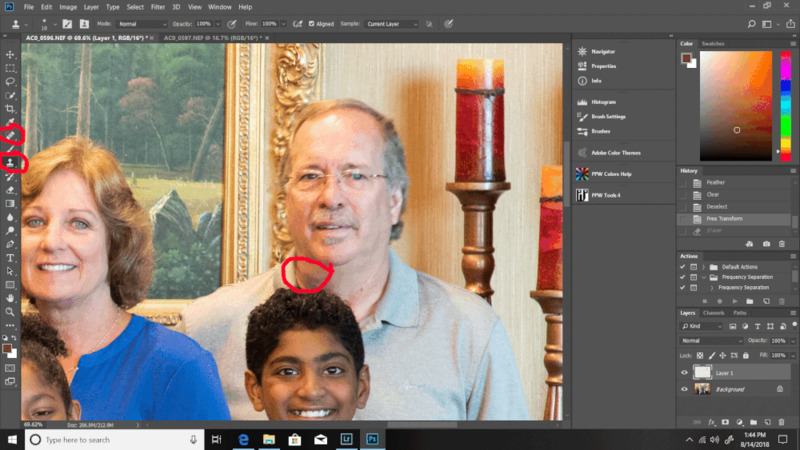 With the clone tool you will first have to "Alt-Click" the source to clone from, so Alt-click on an area of his neck you wish to use to cover up the weird Adam's apple area. These types of corrections there is no one "right way" and will take some experimentation. And there we are! That is my final image. Hope you guys have all learned something cool today! Stop back by to learn new cool things!